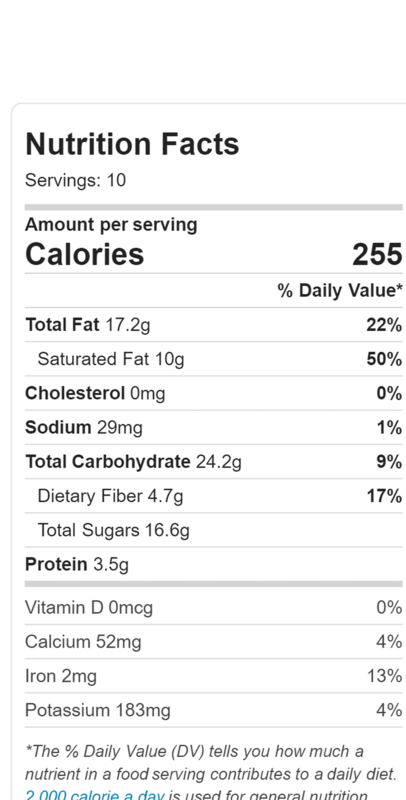 Lately I’ve been trying to incorporate more black sesame seeds into my diet because of all its health benefits. But the other day while I was going through my pantry, I noticed I had seriously overstocked, so I started thinking of other ways I could eat them. It was one of those days where I was craving chocolate, didn’t have the energy to bake, but also didn’t want to settle on a bar of chocolate. So, what did I do? 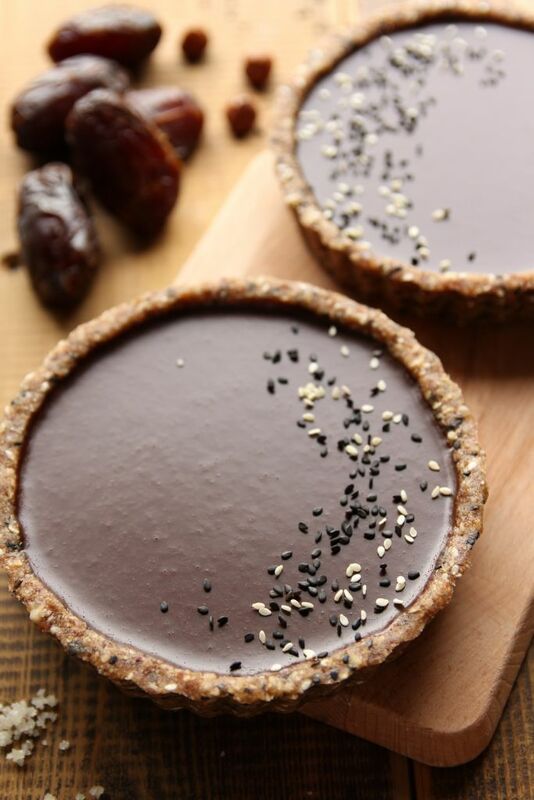 I made these divine, creamy, no bake tahini infused chocolate black sesame tarts! I adapted the recipe from one of my earlier creations, taking into consideration that my main ingredients were chocolate, and sesame seeds. With that in mind I got to work. 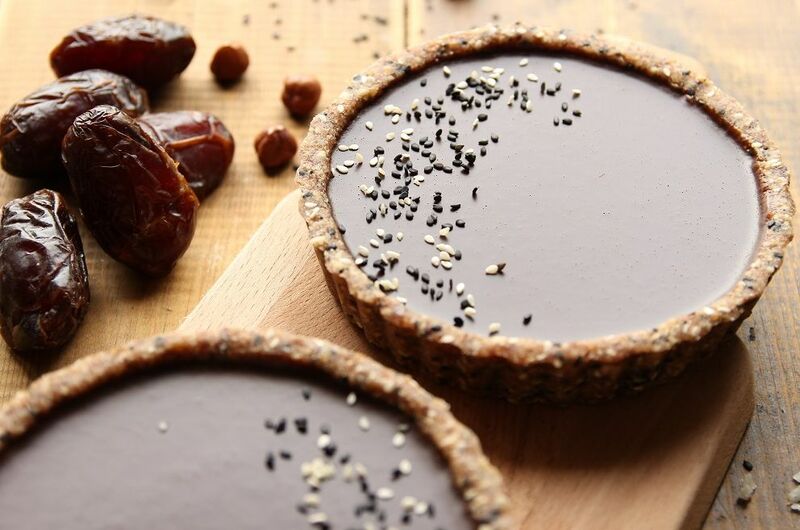 In a matter of minutes, I had blended together an assortment of nuts and seeds along with my favorite dates, then seasoned with a pinch of sea salt, which added a wonderful element of surprise to the base, formed two adorable looking tart bases and set them aside while I prepared the filling. For the filling I made a simple 1:1 ratio chocolate ganache, and at the last minute decided to continue with my sesame theme, so I took the jar of whole tahini out of my fridge and added some to the ganache. The tahini addition automatically reminded me of halva, and you can never go wrong with halva and chocolate. Am I right? I let the tarts set in the fridge before letting my family taste test the goodies. Let’s just say they disappeared into thin air! 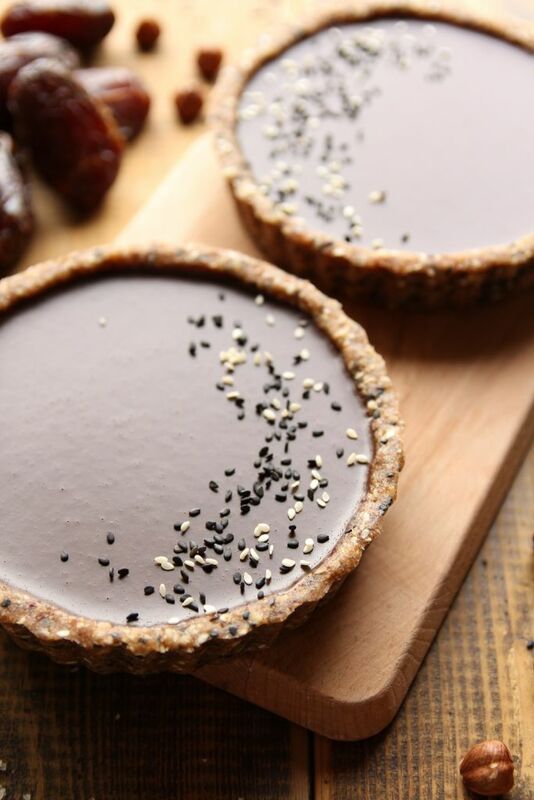 Makes two 14 cm no bake tahini infused chocolate black sesame tarts! For the base, place the hazelnuts, brown rice puffs, pinch of sea salt and shredded coconut into a food processor and blend until rough crumb texture. Add the medjool dates, pits removed, and blend until the mixture starts to stick together. You can check this by taking a small amount of the mixture and pressing it together between your fingers. Finally, add the sesame seeds and briefly blend just until they start to stick to the base mixture. Evenly transfer into two 5.5 inch (14 cm) tart pans. Firmly press mixture into the pans until you have formed two tart bases, then set aside. 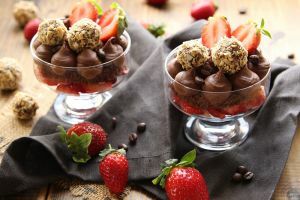 For the filling, place the dark chocolate into a heat proof bowl, then place the coconut milk into a small pot and cook on low, medium heat until it starts to boil. Pour the coconut milk onto the chocolate, add the tahini, and wait a minute before stirring, then stir well until smooth. Evenly pour the ganache into the tart bases and transfer to the fridge for a couple of hours to chill, or until set. When you’re ready to serve, decorate with some sesame seeds, optional sea salt and dig in! These chocolate black sesame tarts will keep in the fridge for up to 5 days, if you haven’t devoured them beforehand. 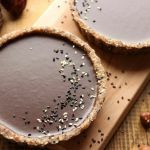 No Bake Vegan Tahini Infused Chocolate Black Sesame Seed Tarts! Easy to prepare, and insanely delicious! Place the hazelnuts, brown rice puffs, a pinch of sea salt and shredded coconut into a food processor and blend until rough crumb texture. Add the medjool dates, pits removed, and blend until the mixture starts to stick together. You can check this by taking a small amount of the mixture and pressing it together between your fingers. Add the sesame seeds and briefly blend just until they start to stick to the base mixture. Place the dark chocolate into a heatproof bowl, then place the coconut milk into a small pot and cook on low, medium heat until it starts to boil. Pour the coconut milk onto the chocolate, add the tahini, and wait a minute before stirring, then stir well until smooth. When ready to serve, decorate with some sesame seeds, optional sea salt and dig in! 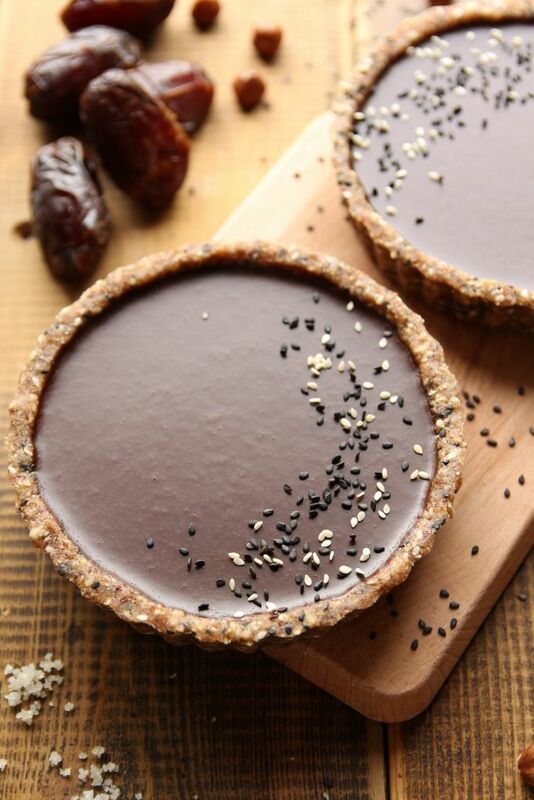 These chocolate black sesame tarts will keep in the fridge for up to 5 days if you haven’t devoured them beforehand! Pin These No Bake Tahini Infused Chocolate Black Sesame Tarts For Later! In a chocolate mood? Next time try my Chocolate Dessert For Two. ← Baked Vegan Beetroot And Black Lentil Balls!